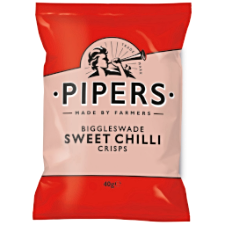 Pipers Crisps Biggleswade Sweet Chilli available in 40g bags. Just ten years ago the family of Sicilian Filippo Genovesi began growing chillies under glass in Bedfordshire. Sourcing a chilli supplier in the UK is very important to Pipers. We don't need to fly ingredients in from halfway across the planet but we still get the quality we demand. We use the Genovesi's cayenne and jalapeno varieties in our spice blend giving our crisps a slightly sweet taste with a very spicy kick.